Have you ever wondered what the difference is between WebDAV and FTP? If so, you are not alone. There seems to be some confusion about the differences between the two protocols. Web-based Distributed Authoring and Versioning (WebDAV), by definition, is a set of extensions to the HTTP (Hypertext Transfer Protocol), medical which allows users to edit and to manage files collaboratively on remote Web servers. One of the major features in WebDAV is the ability to lock files automatically to prevent data from being overwritten by another user. WebDAV also supports XML properties so users can access data about the file, stuff the author, the date the file was modified and namespace manipulation, which allows resources to be copied or moved. FTP – the plain FTP protocol, which has been around since the 1970s. It usually runs over TCP port 21, and is not secure. FTPS – which stands for FTP over TLS/SSL. It is often called Secure FTP and runs over TCP port 21 or 990. SFTP – another file transfer protocol that has nothing to do with FTP. The acronym stands for SSH File Transfer Protocol. SFTP runs over an SSH session, usually on TCP port 22. The protocol has been around since the 1990s. The FTP protocol supports two modes of data transfer, plain text and binary, and usually defaults to plain text. Unlike the WebDAV protocol, FTP does not support automatic file locking, which can lead to users accessing the same file and potentially overwriting changes made to that file by the initial user. WebDrive, often used as an FTP client, supports a variety of protocols. 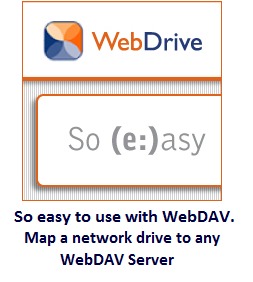 WebDrive can be used as a WebDAV Client to map a drive letter to WebDAV servers, including Sharepoint. WebDrive also supports SFTP and Amazon S3. What protocols does your file transfer client support? Want to try WebDrive? Download a free trial below!